So its Orange Wednesday and I’ve decided to brighten up my Wednesday by researching the benefits of some orange fruits and vegetables. You must think “Gina is well boring”…but this is my alternative to going to the cinema! Oranges are rich in vitamin C which is good for the skin, helps the digestive system. The skin of an orange can be a useful exfoliating facial scrub and skin moisturizer. Males: Did you know oranges protects sperm from genetic damage which can cause birth defects ? Tangerines are also rich in Vitamin C and good for the skin. They contain fiber which helps regulate bowel movement and can assist weight loss. 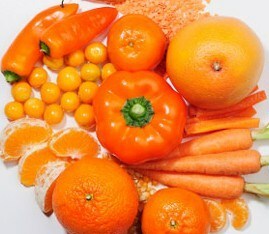 Carrots are rich in vitamin A which is very good for improving eyesight. Not only are they specifically good for your skin, eyes digestive system and teeth, carrots are low in calories and contain no fat. Sweet potatoes are also rich in vitamin A and are useful in the prevention of different types of cancer. They contain double the fiber as other potatoes which give them a slow burning quality. This quality means that they are a low-fiber carb as their energy is used more slowly, which makes you full for longer. Sweet potatoes have a great source of potassium which can help prevent muscle cramps. Females: did you know sweet potatoes can reduce pre-menstrual symptoms (PMS)? This is because when you’re on your period your body experiences high levels of estrogen and low levels of progesterone. However, sweet potatoes are loaded with hormone-balancing vitamins which can help reduce your stress levels and mood swings. Also, its rich Vitamin A content helps prevent PMS acne. So there you have it guys, its not as good as going to the cinema, but unfortunately this is as good as it gets for me. Males: for all those shooting blanks…KEEP CALM and eat an orange. Females: for all those moody and going through PMS …KEEP CALM and eat sweet potatoes.